I’ve been searching for a way to take advantage of all the summer time veggies and herbs, and I think I hit the jack pot! And the rosemary vinaigrette poured over the skewers enhances the flavor of the seasonal veggies. Savory. Delightful. Heavenly. Make vinaigrette first. Whisk together vinegar, mustard, lemon juice, oil, and rosemary in a small bowl. Whisk until mixture thickens. Season with salt and pepper. Toss potatoes, peas, mushrooms, pepper, onion, squash, and zucchini with 1/2 of vinaigrette mixture. Cover and refrigerate for one hour. Preheat grill to medium-high heat. 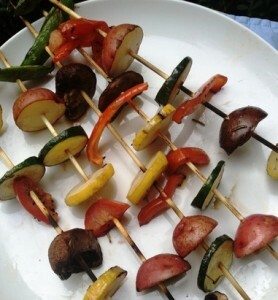 Thread veggie pieces onto bamboo skewers. I left 1/4 inch spacing between veggies on the skewers. Grill skewers 2-3 minutes on each side or until veggies are charred. Season with salt and pepper. Drizzle the left over vinaigrette on top of skewers and serve. 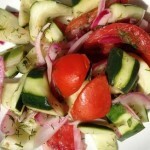 Looking for more summertime recipes? Try my Raspberry Lemon Sorbet, Roasted Eggplant Bites with Veggies and Cucumber and Tomato Salad with Dill.